This fall, lets all make a deal to not wear boring clothes okay??? I have been switching up my work style a little...it may be the new hair, or the new nails but my style is moving from girly to more boss chic. 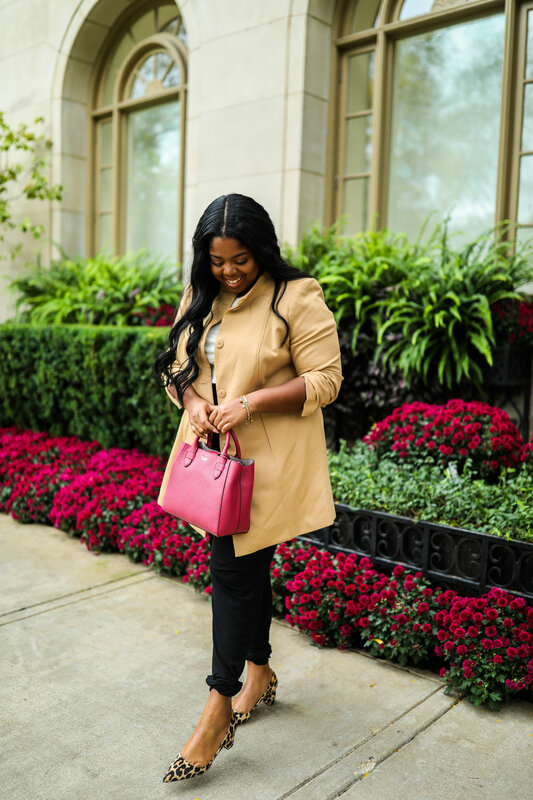 This is one of my favorite looks because it plays with prints, and pops of color while still looking chic enough for the office (whether you work in the creative world or corporate world). My jacket is from the Dia & Co x Girl With Curves collection. My darling friend Tanesha worked tirelessly to create this amazing capsule collection. We share the same style, and If I was to ever show you our text messages you would see lonnnnng conversations about the lack of style in the plus industry. So I was extremely proud when I saw the work she put in...ESPECIALLY this coat! I think she made it specially for me. YEP! To add in a full and fun pop of color, I laced my outfit with Kate Spade accessories. These are timeless pieces that will last you YEARS. (I have Kate Spade shoes I have had since I was in College and they are still in amazing shape). Very well worth the investment. The jacket quality is amazing, it is a thick durable fabric and has stretch in it. I have on a size 16 and it has lots of room for play. These pants run a tiny bit large but I also like to wear my pants larger. I have on a size 18 and I am usually a 16.